West Windsor, N.J. – In capstone projects for their Ad Design III class, Mercer County Community College's (MCCC's) student graphic artists took on a project with global reach. Six student design teams created marketing campaigns for FOR GRANTED.ORG, a nonprofit organization committed to improving lives in underserved communities around the world. (The organization has offices in Princeton, NJ, Washington, DC, and New York City.) They presented their campaigns on May 3 to a panel of judges that included FOR GRANTED’s founder and CEO, David Sokoloff, and Treasurer Lee Merwin. 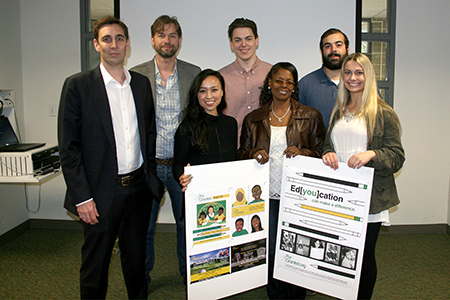 The winning with FOR GRANTED judges: front row from left, FOR GRANTED Founder and CEO David Sokoloff, students Aisha Lopez, Regina Ritter and Taylor Leonardo; back row from left, FOR GRANTED Treasurer Lee Merwin, and students Cole Warner and Ryan Brady. Each year, as part of the final semester of the Advertising/Graphic Design curriculum, the program selects a nonprofit organization in need of marketing materials and then turns the assignment over to advanced students who design a campaign for the client. Campaigns include logos, slogans, newsletter designs, web pages, posters, promotional items and more. The winning team included Aisha Lopez, Regina Ritter, Taylor Leonardo, Cole Warner and Ryan Brady.